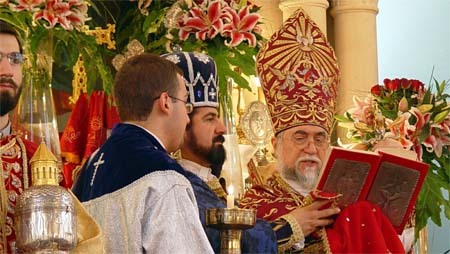 The liturgical wealth of the Armenian Orthodox tradition is rarely more splendidly displayed than it is today, one of the two times a year -- Christmas is the other -- when his Holiness, Catholicos of the Great House of Cilicia, celebrates the Divine Liturgy. 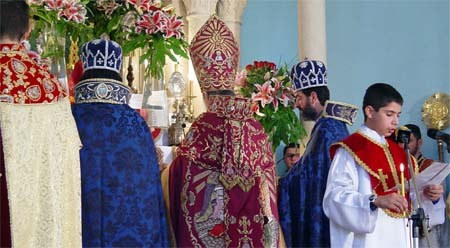 The Armenians enjoy a wide range of liturgical registers, from a subtle pianissimo -- the weekday office on a day of lesser importance -- to a mighty fortissimo -- the Pontifical Badarak on the two highest feasts of the Christian year. It is a great privilege to join his Holiness to photograph him as he prepares for the Badarak today; and the first task in vesting for the liturgy is the decision, "What to wear?" 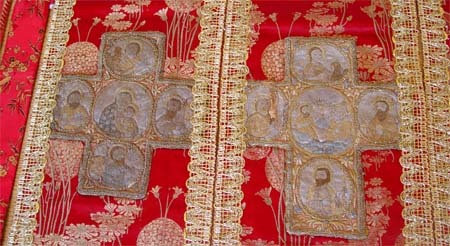 The Catholicos has two choices, a light weight set of scarlet vestments (pictured above) with panels of embroidery that have graced the vestments of the Catholicoi for centuries; or the "new set" (pictured here) dating from the 1970s, and of stunning intricacy and beauty. Wearing the second set poses a very serious problem, the new vestments weigh more than 30 kilos (nearly 70 pounds) and that is a lot of extra weight to carry around in the warmth of a sunny spring day, under the bright lights of the Sanctuary (and with extra lighting for television cameras, today). 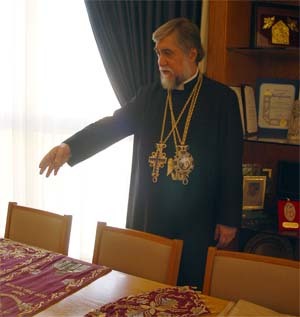 His Holiness tells me that the heavier set was produced during the reign of Catholicos Khoren I, but who wore the new vestments only on one occasion because of their weight. 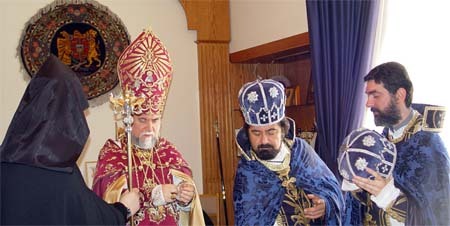 His Holiness's immediate predecessor, Catholicos Karekin II only wore the new set twice for the same reason. I ask how many times his Holiness has worn the heavy vestments, he answers, ten times so far; and it will be eleven times after today, the choice is made. 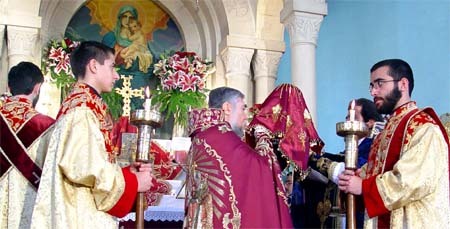 Two priests assist his Holiness whenever he celebrates the Badarak, taking the roles of the deacons. Today, his assisting priests are Fr. 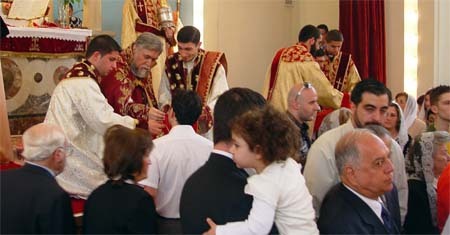 Krikor (below, left) and Fr. Norayr, the first chanting the Easter Gospel, the second bearing the gifts during the Great Entrance. The signal comes at about 10:20 a.m., that the morning office liturgy has ended and the time to begin the Badarak has come. His Holiness and the assisting priests join the deacons who have been vesting in the Great Hall of the Catholicosate. 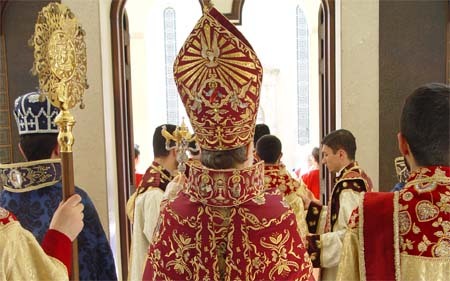 Most everything worn and used in the Liturgy today is reserved for the Pontifical Badarak alone, including cloth of gold tunics with rich red velvet trim for the deacons, special brass candlesticks, and large brass and silver incense caskets. 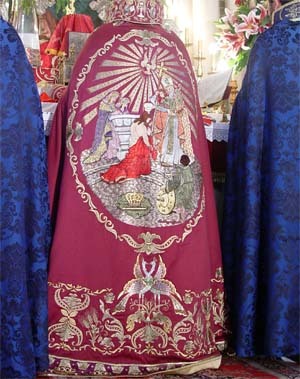 In front of the Catholicos, two deacons carry an embroidered silk panel portraying the Agnus Dei, the spotless Lamb of God, triumphant on this Resurrection Day. The robed Ekmalian Choir and seminarians, are lined up and waiting for his Holiness on the steps of his residence and along his pathway in the courtyard below. When his Holiness appears at the doorway of his residence, the long solemn Easter procession begins amid the joyous sounding of the Cathedral bells. A huge crowd has gathered in the Cathedral for the festive celebration, and the entrance of the Catholicos is magnificent to behold. There can be no doubt that we have reached the pinnacle of the Christian year! There comes a rather wonderful moment during the Enarxis, or the Liturgy of the Word. One of the seminarians comes forward to read the first and second lessons (Old and New Testament readings.) He came to the seminary, I believe this year, in something of a last ditched effort on his parents' part. The lad was quickly being labelled a problem student and a write off in terms any real academic prospects; but, in the caring and challenging environment of the seminary, he has simply flourished and his enthusiasm for life and his native intelligence are shinning through and finding positive expression. As this young member of the Christian fold stands to read in this solemn Badarak, "resurrection" becomes something more than an article of faith. 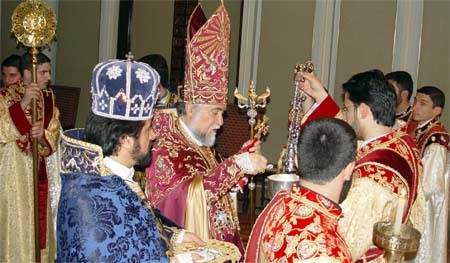 Following the proclamation of the Gospel and the singing of the Nicene Creed, the curtain closes, and his Holiness removes all ornaments: his chains of office, his pontifical ring, the great pallium, and the high mitre of the Armenian episcopate. His Holiness becomes, for the consecration of the bread and wine, no more than simple priest, ready to receive in humility the elements when they are brought to him in the Great Entrance, above. 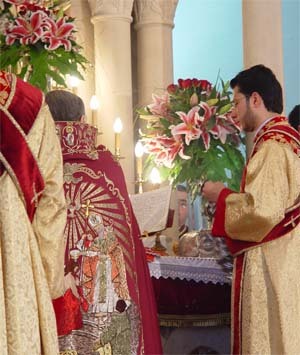 Soon it is time for the kiss of peace, which begins with a priestly blessing from the altar, while the choir sings, "Christ is in our midst ... the Church is made as one person, this kiss given is a bond of fullness ... Enmity has been removed, and love is spread over us all." Click here to see a short movie (6MB) of the blessing of peace. 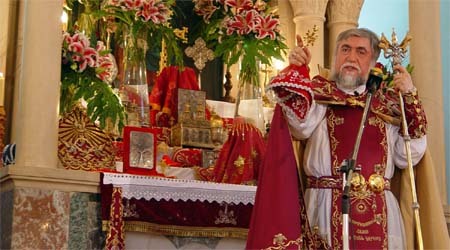 Before the Lord's Prayer, the movement of the great Pontifical Badarak pauses, and his Holiness delivers his Easter sermon. This is one of several Easter messages from his Holiness, including an Easter message to the Armenian youth, where the Catholicos emphasizes on this holiest feast of the Christian year, the "Imperative of a Faith Sustained Life." Yesterday, I reported that the line-up for Communion at the first Badarak of Easter last night was "impressive", but it seems less so in comparison with the massive flock that comes to take nourishment at the high altar here this morning. Later, I ask Fr. Norayr how many he estimates received Communion at the Pontifical Badarak this morning, and he tells me about seven or eight hundred. In fact there are so many that, at one point, his Holiness stops administering the sacrament himself and the liturgy moves on to its conclusion -- the last Gospel, pictured at the top of this post -- while hundreds are still waiting in line for Communion. An even larger crowd than the one inside the Cathedral, fills every inch of the great courtyard between the Cathedral and the residence of the Catholicos. A pathway is made for him -- I think Moses had an easier time at the Red Sea! -- and the sacred cortege makes its way back to the entrance of the residence. 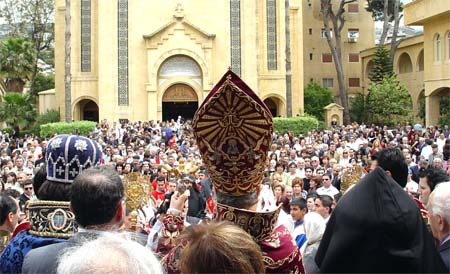 While his Holiness looks on, the throng of Armenian faithful gathered for the Badarak begin to sing the Cilician national anthem, and when the patriotic hymn is finished, his Holiness offers his Pontifical Blessing for the great feast of Easter. In the early afternoon, following the Badarak, there comes a time of parting. The seminarians go home today for their Easter holiday, returning this coming Saturday, ready to sing for the Badarak next Sunday. Twenty-two travel on a bus to Aleppo, which leaves two hours later than expected; but the seminarians are clearly pleased with the prospect of returning to their homes and families, if only for a few short days. As for me ... I miss them already!